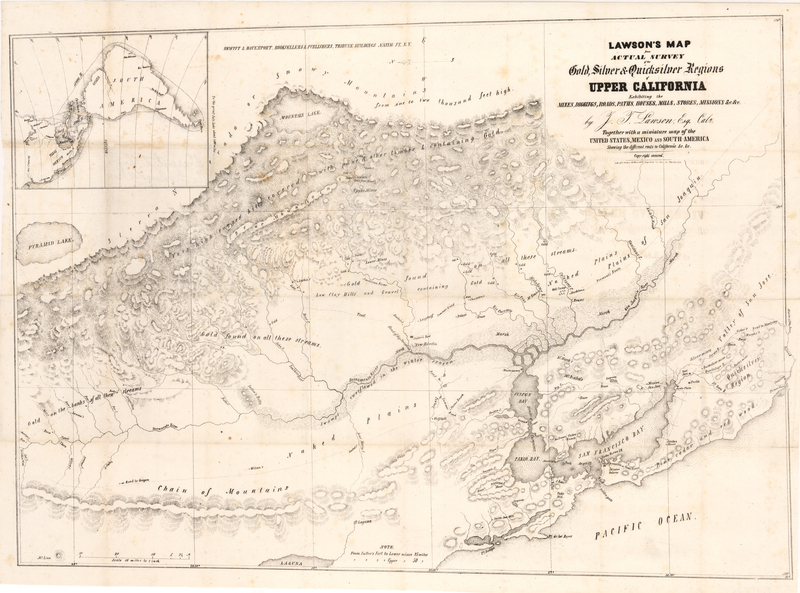 The first map to name Sutter’s Mill and first true guide to the California gold regions. This folding map by Lawson was designed and published specifically for prospectors and miners who were rushing to the region following the discovery at Sutter’s Mill, and was the first map to accurately depict the area’s gold regions. Though Sutter had attempted to keep the initial discovery quiet, news of it soon leaked, and the rush by fortune seekers to California from all parts of the world was on. The map is a bit irregular in nature, perhaps a result of having been published in haste. It contains many references to gold such as ‘Gold found on all these streams’, ‘Low Clay Hills and Gravel containing gold’. And in fact, this is one of the first maps to use the name ‘The Golden Gate’ to describe the entry to San Francisco Bay. The map was designed to help newcomers, and also includes many place names, ranches and householder, recorded locations of gold strikes, trails, forts and even stores. An inset in the upper left quadrant features sea routes from the east coast of America to San Francisco, both the journey entirely by water around Cape Horn, and the routes involving land journeys across Panama and Mexico. Condition: This map was published folding and is in A condition, and includes the original cover, which is also in A condition.